This is a brief extract of an extended memoir, a work in progress. When I was 18, after work I occasionally made my way down to The Royal George Hotel in Sussex Street, feeling daring and hoping to catch a glimpse of someone bohemian like Germain Greer, or maybe strike up a conversation with a long-haired girl in a duffle coat. It was 1964 and the ‘George’ was the watering hole for the notorious group of intellectuals know as ‘Sydney Push’. One evening over a beer, I mentioned to my friend Charlie Brown that I had become increasingly interested in the art world. Taking off his spotted cravat and tying it rakishly around my neck, he cocked his head and looking at me approvingly, said, ‘You might be just the right person to work for Martin Sharp’. ‘You’ve gotta be kidding,’ I said. Charlie told me that Sharp, the well known artist of the underground, and recently banned magazine Oz, was having an exhibition and needed a studio assistant. He scrawled a phone number onto a piece of paper and pressed it into the palm of my hand. ‘Give him a call on the weekend. I’ll put in a good word for you,’ he said. Enclosing my hand with both of his, he looked me in the eye, and gave me the blessing that would open a new world for this ex-surfie boy from Manly. ‘Good old Charlie.’ I thought. On Monday morning I knocked on the side door of Martin’s house. The door opened and a bird-like, grey haired woman with smiling red lipstick extended her hand and said, ‘Hello, you must be Greg’. Pausing and rolling her eyes towards the ceiling she added, ‘His Lordship has not yet deigned to descend the stairs for breakfast, come on in, he will emerge eventually’. ‘He’s not a morning person our Marty,’ Joan confided in me as she made some coffee on the Early Kooka stove. Martin finally appeared through the swinging door looking rumpled. His smile matched his mother’s. It was a smile that he continued to paint throughout his life. Joan laughed, ‘Do it darling’ she said, winking in my direction. Marty was her gift to the art world and everything he did fascinated her, like a wind-up toy let loose. Martin adored his mother and they were a formidable team. Joan, a divorced woman of considerable wealth, was always in the background offering all the support any young man could ever want. Charlie Brown once prophetically suggested that no woman would ever replace Joan in Martin’s life. The Art for Mart’s Sake exhibition was in full production. Martin was an artist who was crackling with ideas and I jumped into his hive of creative freedom as happily as a duck takes to water. I felt like the sorcerer’s apprentice, and the sorcerer had cast a spell over me, allowing me to participate in the making of his magic. Six whirlwind months went by. Lunches with Barry Humphries and girls posing for paintings, framing pictures in the courtyard and Joan tinkling ice in a glass around 5pm declaring happy hour. On the appointed day a truck came and took the exhibition away to the gallery. My work was over. On opening night of Art for Mart’s Sake the Clune Gallery was packed. Many of the works had sold by the time I arrived. Excited guests could be heard declaring, ‘Darling you are wicked, I just love it’, or ‘Oh my God, can you believe this sculpture, I want it’. Martin was engulfed by admirers. His girlfriend Anou was clinging to his arm amongst a blur of social activity. I felt very connected to all the art works that I knew so well, in some cases intimately. But nobody knew what I had done. It was his exhibition. It was clear that all the attention rightfully belongs to the artist, not the framer or the studio assistant. For me, a young man, it was anti-climatic. I had thought that the close connection I had experienced with Martin and my intimate knowledge of how the art was made would have continued into that opening night. I sensed that there would be an after party, but even if there was, I didn’t find it. 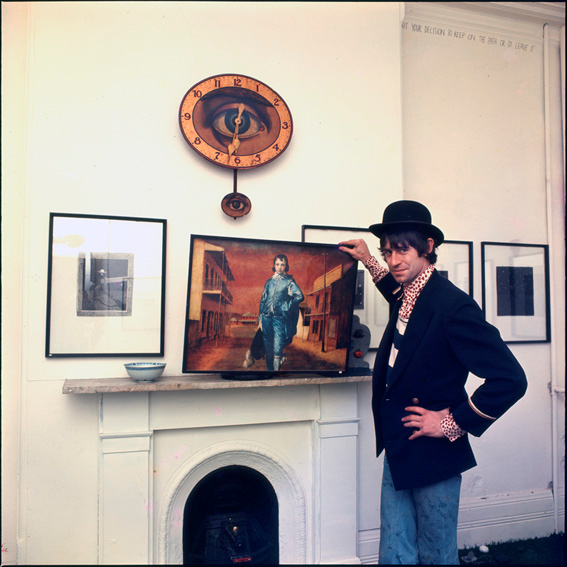 Within a few weeks Martin had left for England to join the Pop Art World to which he belonged and I began working in an English photographer’s studio in Sydney. We were worlds apart, consumed by our own ambition, instincts and self-indulgent urges. Five years later Martin returned. By this stage I had my own photographic studio in South Dowling Street, Redfern, shooting fashion, advertising, magazines and portraits. One day my assistant knocked at the darkroom door and said excitedly that Martin Sharp was here. He wanted to talk to me about his plans to set up The Yellow House. We shared a cup of tea and talked about Vincent’s Van Gogh’s dream of a house filled with creativity where artists worked side by side, feeding off each other’s inspiration and how with the right people and commitment it might be possible to make that dream come true. It was. Our friendship continued until he died in 2013.